Looking for cheap and easy kid friendly meals? I’ve been a single mother for a few years, plus I’ve been cooking for the family since I was 12 years old, because my mom was a single mom. Some days I really can’t stand the thought of having to cook ever again. My two sons want me to make them something big and edible every single day after school! 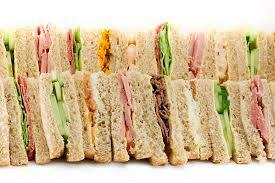 So I joked about just making them a pile of sandwiches, and this was met with happiness and what a great idea that is! So that is just what I did. Everyday, I use an entire loaf of bread and make about 10 sandwiches, using whatever like a can of tuna or deli meats and cheeses I have, along with pickles, onions, tomatoes and lettuce. It almost doesn’t matter, they are so happy to have 5 sandwiches each waiting in the fridge. My very top Number 1 Rule for cooking for kids: make double, or even triple, because you need those leftovers for tomorrow. Absolutely positively. There is little effort to double or triple a recipe. 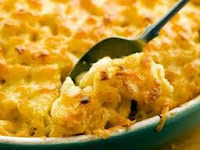 Here’s a super easy way for macaroni and cheese, called Scottish Macaroni. quick easy kids meals, like Scottish Macaroni! 3 – 4 cups grated cheese, any kind, cheddar preferred. Cook macaroni and drain, add can of undiluted soup, add grated cheese and stir well. Place in a greased roaster sized pan and in a 350 degree oven for 20 – 30 minutes, and presto, totally edible Macaroni and Cheese with no homemade cheese sauce. And you cannot taste the tomato soup, it blends right in! Bread Pizzas! Instead of using or buying pizza crusts, you use slices of bread. Besides the bread, you need a jar of spaghetti sauce, mozzarella or similar, and a variety of toppings. This is similar to the nachos (here on the working moms and stress page), in that whatever ingredients you have can go on top, such as onions, green onion, peppers, diced ham, pepperoni, or any meat, pineapple, shredded spinach, tomatoes, or if you are running short of items, just pepperoni. I worked at a pizza place – that was the most popular anyways. Bake on a cookie sheet or similar, middle rack, in a 350 degree oven for about 8 minutes, and presto! 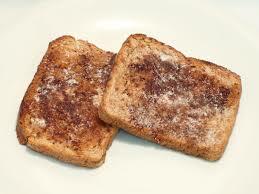 Cinnamon Toast sprinkles is a mix of 1/2 cup white sugar and 1/2 teaspoon ground cinnamon. It will keep forever in a container. I broke half the handle off plastic spoon to make it fit in the container and used that instead of a clean spoon every time. With toasted bread and butter, this is good stuff, just like the image below! cinnamon toast – easy and delicious and a kid favorite! Looking for more ideas, here’s a great site with recipes that kids can make, and where you don’t have to load each page just to look at the recipe (I hate that!). single moms working, or not, or what should we do?